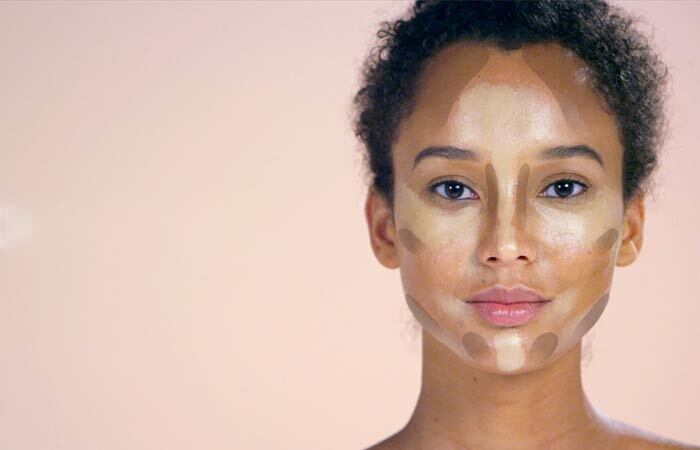 If you’re a fan of contouring, you’ll know that it takes some real skill to master the technique. 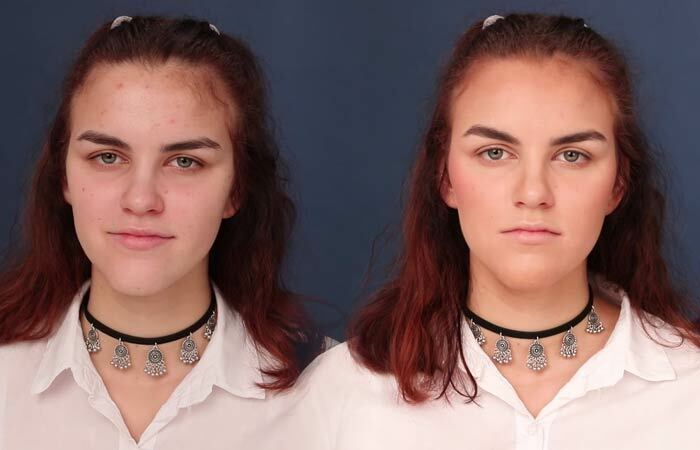 It’s not just makeup professionals who can contour the right way and could rival Kim Kardashian’s glam squad – you can do it too and to help you out, we’ve gathered some handy tips and simple tutorials on how to contour your face within three minutes. Prep your face, apply foundation and concealer, and brush on a light layer of translucent powder to create the perfect base. This will help your contour go on smoothly. 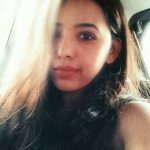 You can choose between powders and creams – powders give you a more matte finish while creams leave you with a dewy one. If you’re a beginner, it’s best to start with creamy products as these are easier to build and blend. For your brushes, use smaller, fluffy brushes for more precision. You need one brush for contouring and one for highlighting. You can try the e.l.f Contour Brush and MAC Large Angled Contour Brush. 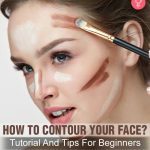 The main spots for contouring include the area under your jawline, the sides of your temples, the sides of your nose, and the hollows of your cheekbones. The trick is to use your bone structure as a guide and build pigment as you go. Highlight only the areas that the light would naturally hit like your cheekbones, brow bones, the bridge of your nose, the top of your cupid’s bow, and the center of your chin. This enhances the effect of contouring. 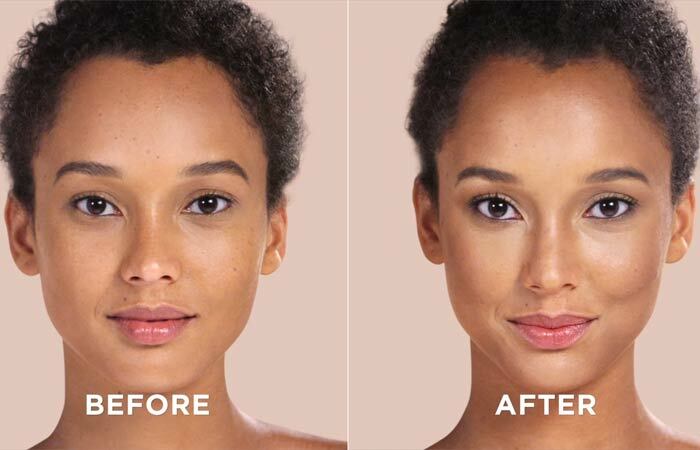 Let’s move onto some simple face contouring tutorials. The number one step is to identify your face shape. We have different tutorials lined up for each face shape. 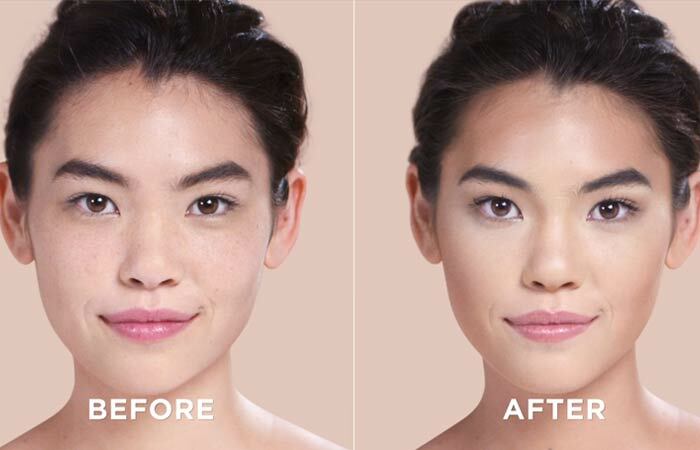 The first step is to prep your skin and apply a light foundation for your base. 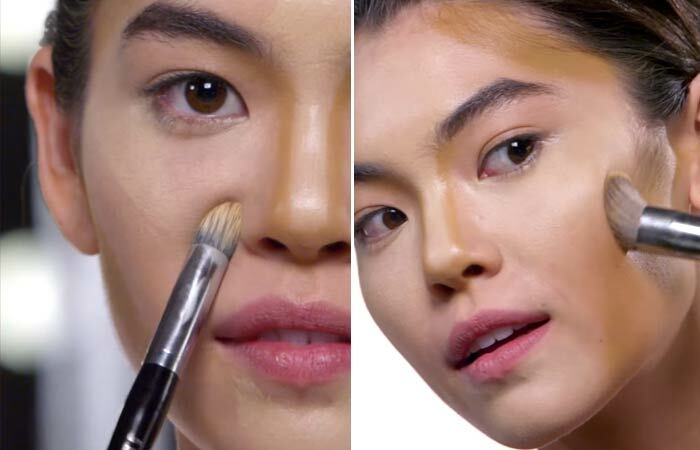 Using a cream highlighter, start by highlighting the jaw, the bridge of the nose, the undereye area, the top of the cheeks, the corners of the mouth, and the center of the forehead. 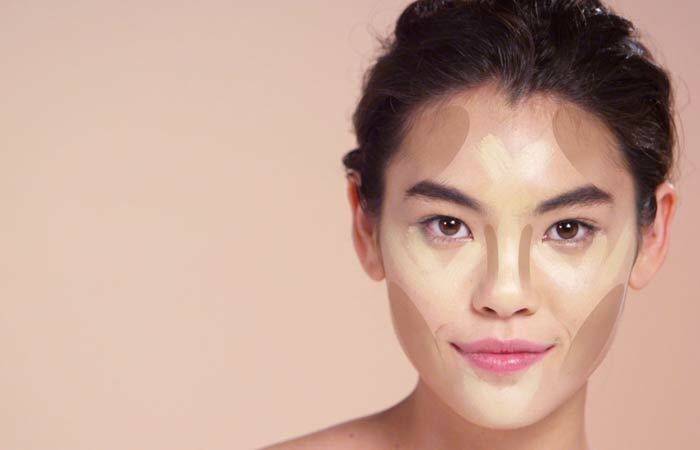 Now that you’ve mapped out your highlighting, the next step is to move on to contouring. Make sure the color you use is appropriate for a shadow and not one that’s too warm or orangey. Use a brush and do your contour down the hairline, coming into the temple slightly to narrow down the forehead. For your cheek contouring, follow your natural bone structure and contour from the top of the ear toward the corner of the mouth. Apply a little bit on the sides of the nose for a more chiseled look. Once everything is mapped out, it’s time to blend it out, and this is where it can get tricky. 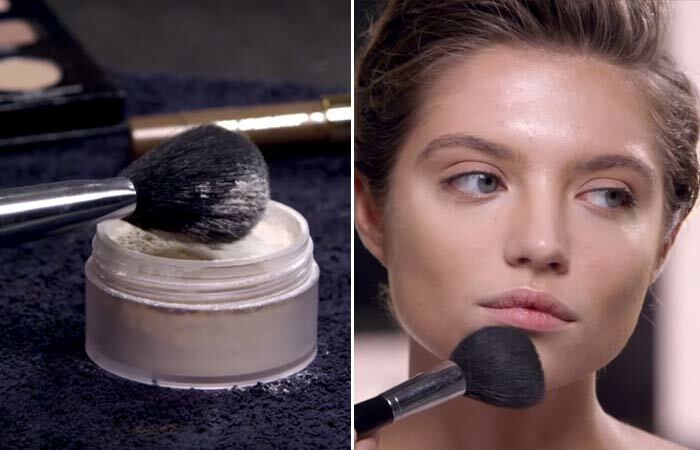 Use a small, fluffy contouring brush. Start with small little strokes on your forehead to blend out the highlighter and repeat this step on other areas as well. Use a big contouring brush for the contoured areas – start with your forehead and slightly push down the product, while blending it in properly. 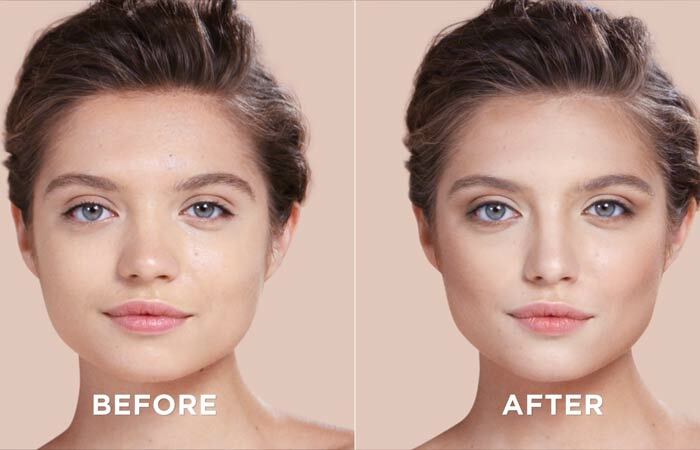 When you’re blending through your cheeks, use an upward movement for a softer look. The idea is for it to look really soft and smooth so make sure you blend everything out extremely well. Using a translucent powder and a brush, gently press and roll the brush on your skin. This will make your product last longer. You can go in with some blush or bronzer to add a little bit of warmth to your look. Voila! That’s the end result! Doesn’t it look super natural? Prep your skin and use foundation before you begin. Start by highlighting right at the center of your forehead, the bridge of your nose, followed by the center of your chin. Create long, inverted triangles under the eye area. Pop a bit of highlighter on your cheekbones as well. Use a taupe, cool undertone shade for your contour and steer clear of shimmer. Start contouring down from the ear as this helps slim down your face instantly. Next, contour your temples by creating a C-shape. 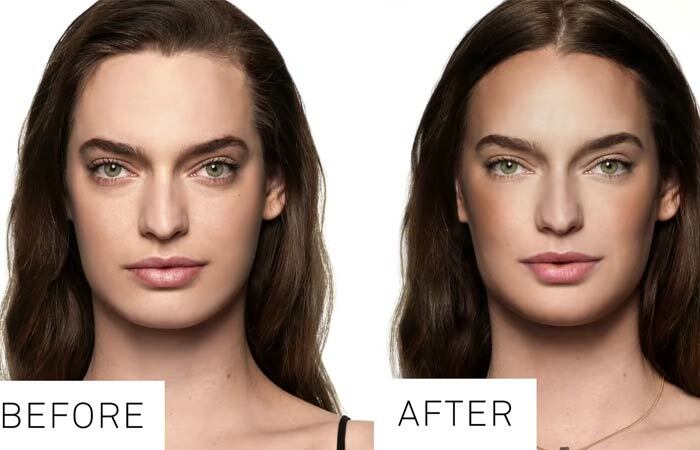 To slim down your nose, go over the sides of it with your contour shade. Use a small, fluffy brush and blend out the highlighted area by gently pressing and rolling the brush over. Blend the contour with a big contouring brush until you can’t see any harsh lines on your face. Use a setting powder or a translucent one and gently pat it all over using a powder brush to set your makeup. Once you’re done with prepping your face and applying foundation, it’s time to map out your highlighter. Start at the center of your forehead and move towards the center of your chin. To connect the two, draw a small line at the center of your nose. Starting right in the tear duct, highlight the under eye area and create two Vs. Also, highlight the outer corners of your mouth. When choosing your contour shade, it’s best to pick cool greys and taupes for mimicking natural shadows. Drag the product along the jawline, underneath the cheekbones, and the sides of the nose. The trick is to start blending your highlighter first and then blending the contour into the highlight. Gently press your brush against the product and blend the dark with the light. To set your cream contour product, use a little bit of powder to ensure it lasts all day. Use a big brush to roll and pat the powder onto the areas. You can add some blush and bronzer for warmth. And you see the difference? Prep your skin with moisturizer and foundation. Highlight upward in an arch or half-circle on the forehead, and slide it right down your nose. Also highlight your chin, the outside corners of your mouth, your undereye area, and your cheekbones. Choose a neutral shade for your contour. Use the angled side or the tip of the brush to contour underneath the cheekbones. Then contour the outside of your forehead, the sides of your nose, and your jawline. Starting from the inside corner of your eye – blend the highlight from the center outward, and the contour from the outside inward. Use a translucent powder to set the product. Starting from the center of your face, use a brush and lightly press and roll the powder on the areas, without disturbing the makeup underneath. And (drumroll) – this is the final outcome! For a diamond-shaped face, contour in the area below your cheekbones, starting from your ears and ending in the middle of your cheeks. Highlight your undereye area, the middle of your forehead, and the middle of your chin to broaden these naturally narrow areas. If you have a rectangular face, focus on contouring the sides of your forehead to make your hairline appear more narrow. Also, go along your hairline, under your jawbone and the area below your cheekbones – starting from your ears and ending in the middle of your cheeks. Highlight your undereye area, and along your brow bone, and the middle of your chin. Contouring may seem a tad bit intimidating initially, but as you keep doing it, you’ll eventually get the hang of it. 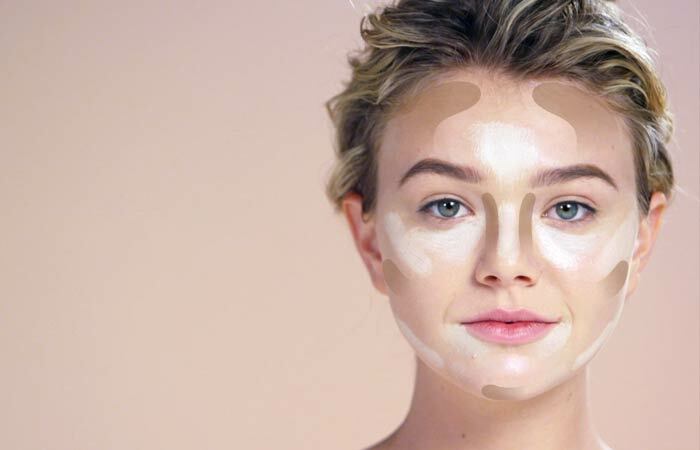 Here are a bunch of contouring hacks, dos and don’ts, so you aren’t left feeling dazed and confused. Firstly, it’s important to contour for your face shape to ensure that it looks natural. For your contour product, avoid using anything that’s too orangey or shimmery. To contour your nose, you can use a strip of cardboard paper for a straight line. Draw two lines down the sides of your nose, starting from the inner corner of your brow bone, and create a U-shape at the tip of the nose. Use the right brushes and tools! We recommend trying the brushes from Real Techniques. 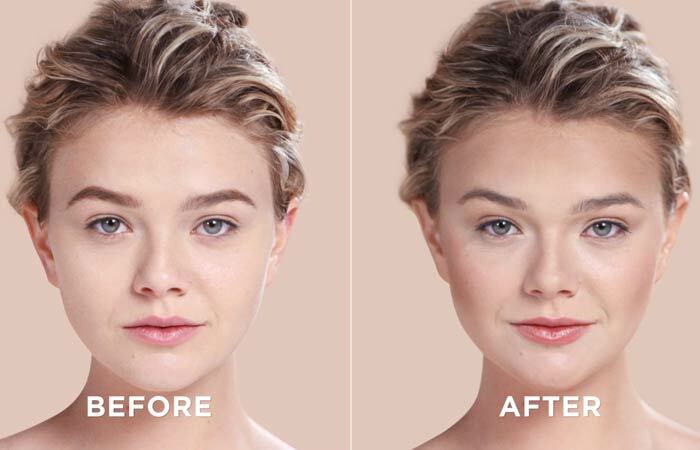 Now that you’ve got all the basics down, it’s time to try the sculpted look out using this as your guide. 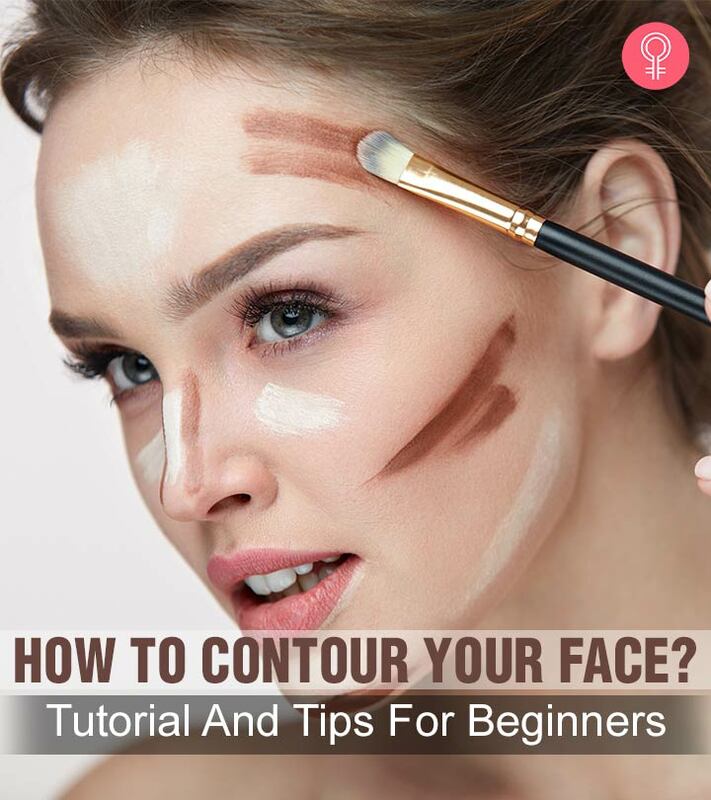 To the beginners, our only advice is to keep it simple and buy yourselves a contouring kit that has everything you need – try Smashbox’s Step By Step Contour Kit or something similar. This palette is appropriate for all levels – from amateurs to professionals and is sold in different shades. What are you waiting for? Go try it out yourself now! 7 Fall 2015 Makeup Trends We Want To Wear Right Now!